We've created this new basket for beginning 4-H basket makers and we hope you'll enjoy using the unique 'D' Swing Handle. Many thanks to Martha Arterburn, Allen County, Kentucky Extension Agent for 4-H Youth Development. Calculate Supplies for 1 to 20 4-H Swing Baskets with the Basket Supply Calculator. The Supply List gives you the least expensive way to purchase the supplies for your quantity of baskets. View on-line or print to your printer. Keep your weaving even as you make your basket. When weaving the sides, do not leave spaces between the rows of weaving. As you weave, gently push or pull on the stakes to keep them vertical, maintain a pleasing shape, and keep the stakes equal distance apart. Sand the wooden handle if desired. Cut 13 pieces (stakes) 25" long from your thickest pieces of 3/4" Flat Reed and soak for a few minutes. Measure across the base of the handle and mark the mid-point with a slight pencil mark. Stand the handle in front of you and place one stake perpendicular to the handle, laying the stake under the handle at the mid-point. Center this stake (12" extends on either side of the handle). Place this and all other stakes with the rough side up. Lay a stake to both sides of the center stake—placing these stakes over the handle and spacing the stakes about 3/8" to 1/2" apart. Continue adding stakes, spacing them apart and centering them, until you have a total of 7 stakes alternating over and under the handle. Next, you'll weave 6 stakes parallel to the handle (3 stakes to each side of the handle). Alternately weave each stake over and under the stakes that were placed across the handle. Center each stake and adjust spaces (3/8" to 1/2" apart) so that your base measures 8" square. Place a clothespin in each corner and spray stakes around the edge of the base. Crease each stake upward at the edge of the base. See Fig. 1. Soak a thinner piece of 3/4" flat reed (weaver) in water. This piece should be long enough to weave completely around the basket plus 4 or 5 inches for overlap. Note: The first weaver continues the alternating weave found on the basket’s base. Begin your weaver on the outside of a stake (Stake A) and secure weaver to outside of stake with a clothespin. (Make sure the rough side of the weaver is facing the inside of your basket.) Allow the next stake (Stake B) to remain on the work surface and weave above it. Bend the following stake (Stake C) upward and place the weaver outside of this stake; secure with a clothespin, etc. See Fig. 2. Continue to weave above one stake and outside the next using a clothespin on each vertical stake to hold the weaver in place. Every other stake will remain on the work surface. Your second row of weaving will “pick up” the stakes that were missed by the first row of weaving. Weave completely around the first row and “finish off” the weaver by overlapping and hiding the ends behind the stakes (overlapping the two ends for a distance of four stakes). See Fig. 3. Pack the rows of your basket. Soak stakes that extend above the top of your basket. 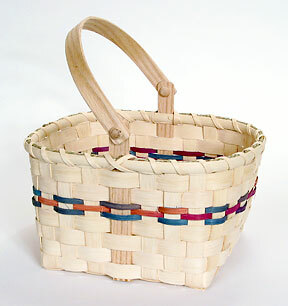 Identify the stakes where the top row of weaving is on the inside of the basket. Crease these stakes to the inside. Cut each stake to length then tuck behind a weaver on the inside (the cut end will be hidden). See Fig. 4. Cut all remaining stakes level with the top of the basket. Measure the basket's circumference and cut the rim material to length (cut the outside rim 4 inches longer than the circumference and cut the inside rim 2 inches longer than the circumference). Sand the oval side of your rims. Soak rims for 10 to 15 minutes then attach rims to basket with clothespins and mark the overlaps with a pencil. The flat side of each rim will be placed against the side of the basket. Remove rims and carve the overlap areas—carving the rounded side of one end of each rim and the flat side of the other end. Attach rims and rim filler (#3 Sea Grass) to the basket using cable ties, clothespins or twist ties. Overlap the rim filler a bit. Lash the basket (creating a back stitch at the handle) with 1/4" Flat. The Allen County Kentucky 4-H kids had fun making their baskets, we hope you also enjoy making and using your 4-H Swing Basket.